After being stonewalled by business organizations in its effort to count corporate shuttles along Highway 85, the Santa Clara Valley Transportation Authority set up cameras to determine how many buses are on the road. “The best we can do is spy on them in video cameras,” said Adam Burger, the transit agency’s senior transportation planner, at an advisory board meeting in Cupertino on Monday. It could be that in the Bay Area/Silicon Valley, the companies are gun shy about providing data given the opprobrium cast against them in San Francisco ("San Francisco locals take on luxury tech shuttles as microcosm of gentrification debate," Guardian), including protests and attacks on buses ("Someone is attacking Google and Apple's shuttle buses," New York Post). Because of problems with protests and attacks, Silicon Valley employee shuttle buses tend to be unmarked. 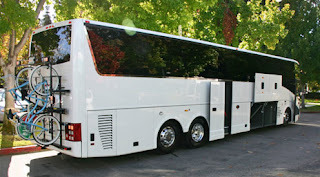 This bus has rear bike racks ("SF may crack down on corporate shuttle buses," All Things D). Still, such services, as part of licensing agreements, should be required to provide data on scheduling, the number of trips and riders, etc., to local transportation planning agencies, such as Metropolitan Planning Organizations, for planning purposes. Similarly, as a transportation demand management measure, high use shuttles should have access to the bus stop and shelter network within communities, maybe for a fee as is now being done in San Francisco (Google and Apple shuttles will pay to use San Francisco's public bus stops"," GM Verge blog). In my typology of transit services through networks operating at various scales, employer and campus shuttles tend to be part of what I call tertiary transit subnetworks. In this case, and with the University of Maryland College Park, which has an extensive bus network service providing links to a number of Metrorail stations in Maryland, I'd call this a tertiary network operating at the metropolitan scale.